Genesis 1:9- And God said, Let the waters under the heaven be gathered together unto one place,and let the dry land appear: and it was so. Genesis 1:10- And God called the dry land Earth; and the gathering togetherof the waters called he Seas: and God saw that it was good. Make your chocolate instant pudding first. Just follow the directions on the back of the box. Then mix that up real good and pour into a container. I used a large stand up glass bowl. 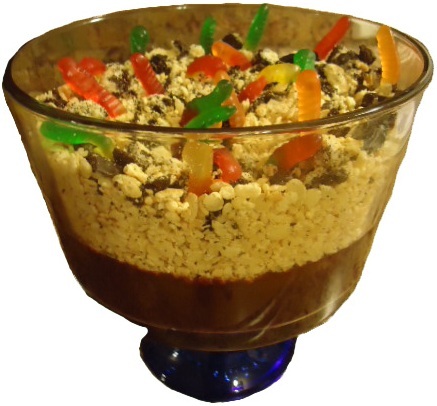 Then layer your 4 cups of cereal on top of the pudding in the glass bowl. I took about 10 choclate cookies and put them in a ziplock bag and crushed the cookies with the bottom of my measuring cup. Then I layered those cookies on top of the cereal. Next I took the package of gummy worms and stuck them down in the dirt cake. As you can see in the picture above I made some gummy worm ice cubes to go with this for the kids in church. They loved these. Believe it or not this is the first dirt worm cake I have ever made. This was a lot of fun and the kids really enjoyed my effort. lol.. Teach the kids that God made the dirt and that he formed the dry land like it talks about in Genesis 1:9-10. This may be a rather simple lesson but you would be surprised that some kids really didn't know this. You may get visitors in your class, and they may not know a whole lot about Jesus and how God made the worms and dirt. Add your milk to the pudding. And stir it up real good. Pour the instant pudding in to a glass bowl. Add your 4 cups of Cereal for the pretty dirt effect. Grab about 10 cookies or more. I used the always save kind but you can use oreo's or any other type of cookie you like. Put the little cookies inside the ziplock and crush the little boogers up. Pour the chopped up little cookies on top of the cereal. Looking good huh?